One of the most rewarding aspects of studying abroad is the exposure to different cultures, beliefs and ways of thinking. However, adjusting to these cultural nuances can sometimes be a challenge, especially for those with limited travel experience. To help students prepare, we’ve put together some general cultural etiquette guidelines—share this information with your students to help them successfully (and safely!) transition into their new environments abroad. Research what type of attire you should wear to blend in with the locals in your host country. Keeping local customs, attitudes, and religious beliefs top of mind when choosing attire is not only the respectful thing to do, but it also helps keep you safe since sticking out like a sore thumb only serves as temptation to those who are up to no good. In general, it’s best to steer clear of wearing gym clothes, ripped jeans and oversized anything in public. While “athleisure” may be a hot trend stateside, rocking those yoga pants or basketball shorts outside the gym is not common in many parts of the world and could cause some unwanted attention. A good rule of thumb is to dress modestly and look polished at all times, as many cultures hold appearance and fashion to a high standard. Avoid wearing anything flashy, U.S.-branded (such as sports team logos) or overly expensive, as this is an easy way for criminals to target foreigners. Even with apps like Google Translate, navigating daily life in a new culture can bring about awkward social encounters or communication mishaps. While you don’t need to be fluent or have perfect pronunciation, learning some key phrases in your host country’s language not only makes a great impression, but will inevitably make your travels much smoother—especially when traveling outside major tourist areas where English may not be widely spoken. It can also help alleviate frustration when you need to navigate more complex situations such as getting to a new location or finding help during an emergency. Try to stick to simple and direct language, as jokes and figures of speech could be mistranslated and (accidentally) offensive. Your local friends and acquaintances will likely want to discuss what life is like in the U.S., and having some knowledge of their country’s current events, pop culture and history will make these exchanges much more enriching and mutually beneficial. This knowledge can also help inform which topics are considered controversial or offensive in your host country. And remember—while there is nothing wrong with sharing your lifestyle and experiences with others in an effort to explain what life is like in America, be mindful of sharing any potentially offensive comparisons and opinions regarding theirs. Dining etiquette varies by country, and planning accordingly is time well spent, especially if you stop to consider how much time you’ll likely spend eating in your destination. It’s hard to go wrong if you go with the flow, observe the behaviors of those around you, and try to keep an open mind. Be mindful that texting at the dinner table is considered rude in many parts of the world, even when dining solo, and leaving food on your plate could be considered the ultimate insult to your host. While some of us have more adventurous palates than others, you could be missing out on some great cultural experiences if you refuse to sample the local cuisines. Make sure you research local dining customs as well to ensure you don’t make any accidental faux pas. While you may be comfortable expressing yourself in the United States, some cultures may not be as welcoming. Inform yourself of local laws, customs and any behaviors that won’t be tolerated in your host country. This can include local attitudes toward women and the LGBT community, public displays of affection, hand gestures, limitations of local law enforcement, and more. If you’re planning to drink, research the drinking age – including whether drinking is even permitted at all – in your host country and remember to be cognizant of how you’re portraying yourself, your school, and your culture. Unfortunately, Americans have a fair share of stereotypes in some countries, and the last thing you want to do is prove any of them to be true. Comedian Jerry Seinfeld birthed the term “close talker,” meaning someone who gets awkwardly close to you during conversations. However, unlike the U.S., “close talkers” are not considered an invasion of personal space in many countries, and moving away could actually be interpreted as a rejection! If this makes you uncomfortable, try to stay calm—in most cases, no one is trying to make you feel uneasy, and this is simply how they’re used to communicating. Rule of thumb: play it safe and be on time, no matter where you’re studying. Maintaining punctuality is one of the easiest and most painless ways to make a good impression without a lot of effort. Yes, in some cultures, it’s not expected to be on time, but wouldn’t you rather not risk it? And on the flip side, if your class or meet-up does get a late start, take a relaxed view–while punctuality is considered a virtue in many countries, it’s still common and even expected to start five or ten minutes late in many cultures. While tipping is pretty much mandatory in the U.S., not all countries play by the same rules. In fact, in some destinations, a tip is actually considered an offensive display of wealth and pity—leave a 20% tip at dinner in a restaurant and you could actually ruin someone’s day. On the other hand, forget to tip in certain countries, and you’re committing more than just an innocent faux pas—many service people around the world rely on tips to feed their families, pay the bills and keep a roof over their heads. Make sure you research tipping etiquette in your destination so you can avoid these kinds of issues. 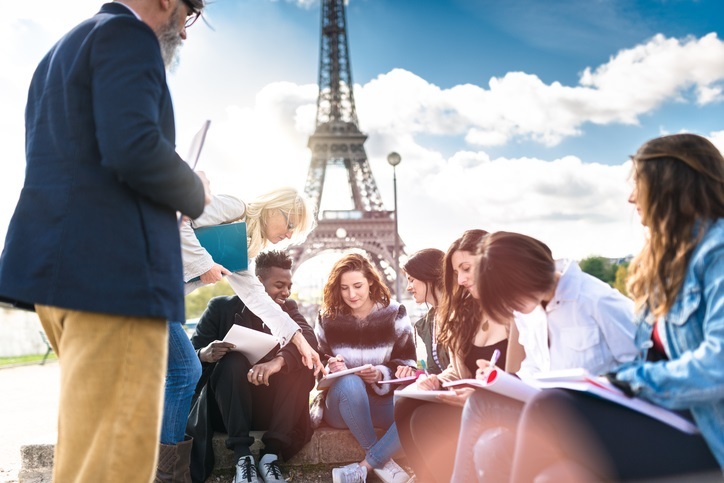 Need help educating your students before they travel abroad? Contact us today to learn more about pre-travel preparation and holistic travel risk management.